Nixeus are not a well known monitor manufacturer, but we've had a fair amount of interest from readers about their line-up of gaming displays. We thought it would be interesting to take a look at one of their newest models to see how it performs and whether it can compete with the well-known manufacturers like Asus and Acer when it comes to gaming monitors. Their "EDG" (Engineered and Designed for Gamers) series has several sizes and options available which we will talk about in a moment. Nixeus' website says: "Established 2009 in Los Angeles, California – Nixeus Technology Inc. is an American company, brand and manufacturer specializing in computer monitors, peripherals and consumer electronics. Founded by executives with extensive knowledge and experience in the consumer electronics and PC gaming industry – we are committed to producing premium quality products to create an immersive experience for competitive gamers, entertainment, content creators, business and productive applications." Their screens are available primarily in North America at this time, so if you're after one elsewhere you will have to find someone who is importing them. So far in the monitor market they have been focused on delivering premium AMD FreeSync certified gaming displays. 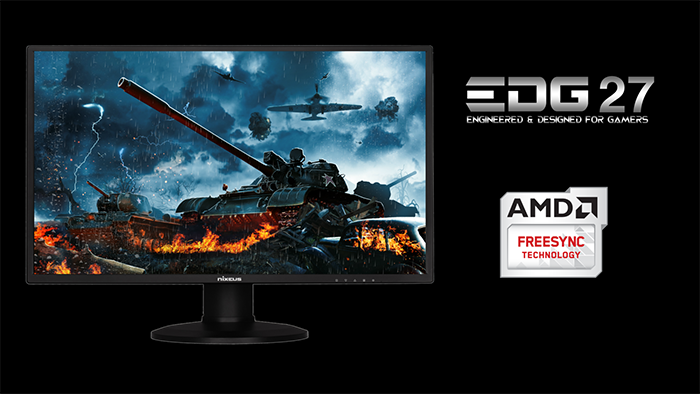 Their website states: "We have been working with AMD and AMD Radeon Technology Group since the very beginning of FreeSync development to create the best performing FreeSync gaming monitors in the world! Every Nixeus gaming monitor goes through an extensive validation process to ensure compatibility with all available video graphic devices and hardware." Updated models to the v1, with thinner bezel design and FreeSync support over HDMI. 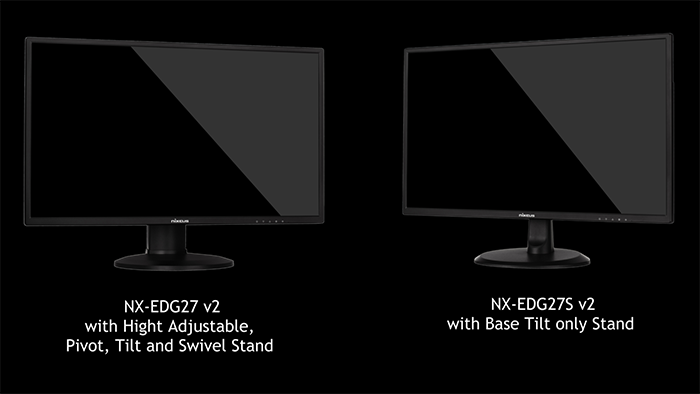 We have with us the NX-EDG27S v2 display, although aside from the stand which is tilt-only, this is identical to the NX-EDG27 v2 model. The focus is on gaming, with a 144Hz IPS-type panel, 2560 x 1440 resolution, 4ms G2G response time, advertised low input lag, AMD FreeSync support (30 - 144Hz range) and a new thin bezel design. If you would like to help support our continued work please consider making a donation no matter how small or large. Thank you. The NX-EDG27S v2 offers a good range of connectivity with 2x DisplayPort 1.2a and 2 x HDMI 2.0 offered for video connections. For PC connectivity the DisplayPort is the most common option, with HDMI being available then for connecting external games consoles or Blu-ray players potentially. Both will support variable refresh rates which is an upgrade to the v1 of this display where VRR was only supported over DisplayPort. From NVIDIA cards you can only use VRR over DisplayPort. The screen has an external power supply and comes packaged with the power brick you need, and a US power plug. It's just a normal kettle lead so easy enough to find a spare one of those to power the screen in the UK. A headphone output connection is provided as well for audio pass-through, and there are also some integrated stereo speakers. This is one of the first screens we've seen in a while which doesn't offer any USB ports, which we miss a bit. It's a gaming screen though and they're not vital or anything. Below is a summary of the features and connections of the screen. Keep in mind we have the S version with us which has the more basic tilt-only stand, but the normal version also includes a more functional stand with height, swivel and rotate also available. The NX-EDG27S v2 comes in a black design with matte plastics used for the bezel, stand and base. There is a moderately thin bezel around all four sides, with a thickness of ~12mm along the sides and top, and a little thicker at ~15mm along the bottom edge. There is a white 'Nixeus' logo in the middle of the lower bezel, and small OSD control labels also shown on the front bezel in the bottom right hand area. The design is simple and functional without being flashy. The back of the screen is encased in matte black plastics with a mostly flattened finish. There are VESA 100 mounting holes in the middle of the back of the screen as you can see from the above photo. The arm for the stand slots comes attached to the screen but can be unscrewed and slotted out if you aren't using the provided stand. On the S model that we have with us here, the circular black plastic base clips easily on to the bottom of the arm. There isn't any cable tidy clip/hole on this stand, and overall it's a basic design. There is a only a limited tilt adjustment offered from the S model which does provide a good tilt range, but is quite stiff to operate, especially when tilting the screen backwards. We missed having height and swivel adjustments, but the non-S model is available if you need those. We can only really comment on the functionality of the model we have with us here for testing, and it felt a bit limited to be honest. Unless you're going to mount the screen, we'd suggest the non-S model would be better with the fully functional stand. The materials were of a reasonable standard and the build quality felt ok. It lacked the premium feel, design, materials and extras of more expensive gaming monitors and was a bit more of a no-frills offering in terms of its aesthetics. Some people may of course prefer that. There was no audible noise from the screen, even when conducting specific tests which can often identify buzzing issues. The whole screen remained cool even during prolonged use. The back of the screen features the connections. There are 2x DisplayPort 1.2a and 2x HDMI 2.0 provided for video, along with the power input and an audio output. There are no USB ports on this model. The OSD is controlled through 4 pressable buttons located on the back of the screen in the bottom right hand area. There is quick access to the volume control using the up/down arrows, and the input selection using the '2' button. The main menu provides a lot more options. Navigation was a bit of a pain sometimes to be honest and it didn't feel very intuitive. It doesn't help that the guidance at the bottom of the OSD menu (shown above) doesn't line up with the actual button logos on the front bezel, so they aren't in the right place or aligned in the same order. You have to trust the etchings on the front bezel to understand which button it is you're pressing on the back of the screen and ignore the guidance at the bottom of the on screen software. Using the up/down arrows to navigate, and also sometimes move left/right got a bit confusing sometimes too. The software was responsive and there were a fair few options to play with at least, but it's not the kind of menu you'll want to play around with much we don't think. Out of the box the screen used 27.4W at the default 50% brightness setting. Once calibrated the screen reached 19.1W consumption, and in standby it used only 0.6W. 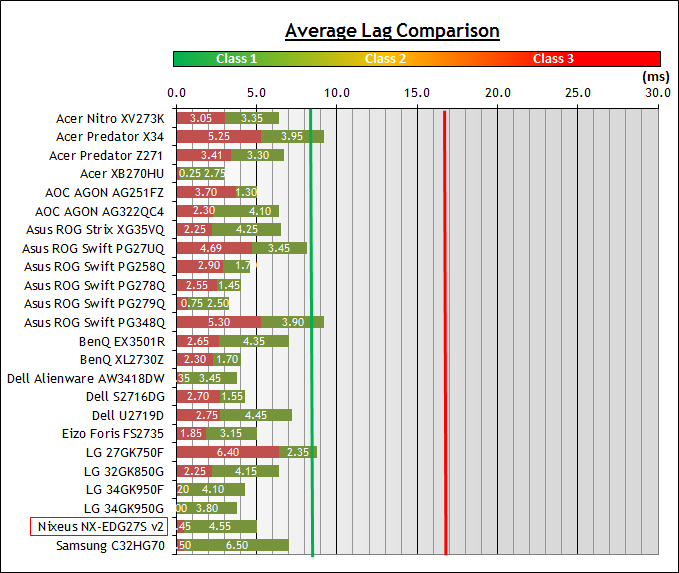 We have plotted these results below compared with other screens we have tested. The consumption (comparing the calibrated states) is comparable to most of the similarly sized screens here as you might expect. It is less than the Asus ROG Swift PG27UQ, which while being the same 27" in size, has a Full Array Local Dimming (FALD) backlight for HDR and so uses a lot more power. Larger 34" screens also dray more power due to their size. 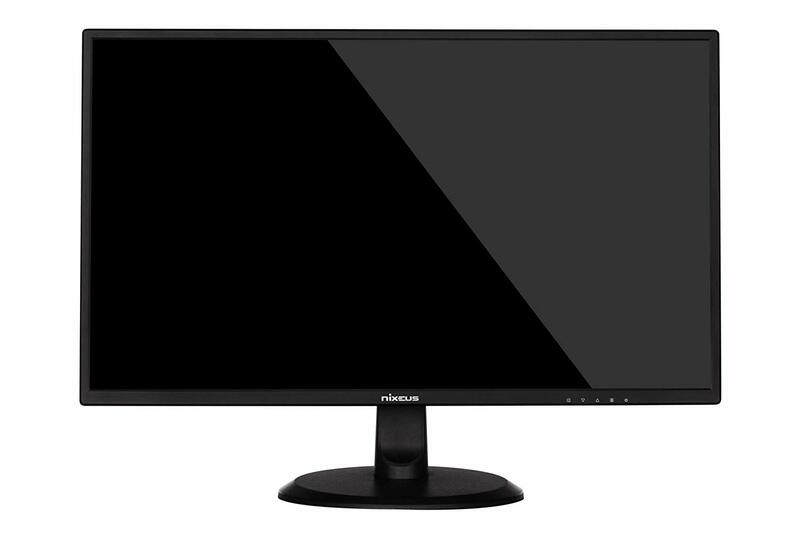 The Nixeus NX-EDG27S v2 features an AU Optronics M270DAN02.3 AHVA (IPS-type) technology panel which is confirmed when dismantling the screen as shown below. The panel offers 16.7m colours with a true 8-bit colour depth. 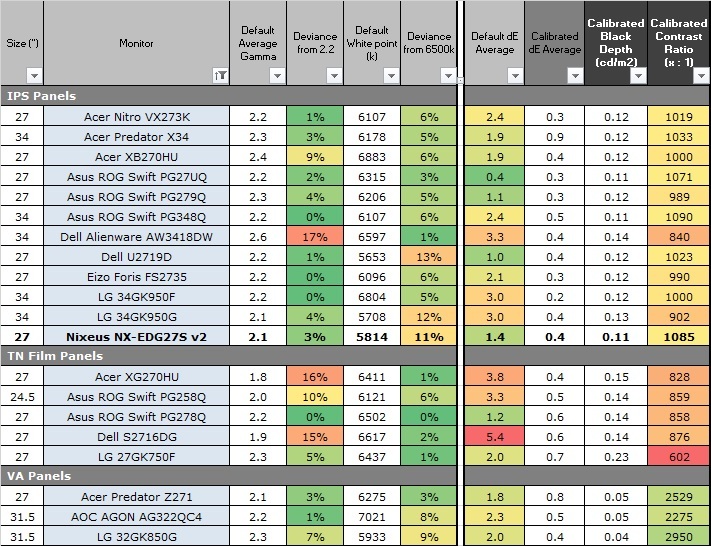 This is the same underlying panel incidentally that is used in competing similar models like the Asus MG279Q, Acer Predator XB270HU and Eizo Foris FS2735. The screen coating is a light anti-glare (AG) offering. It isn't a semi-glossy coating, but it is light as seen on other modern IPS type panels. Thankfully it isn't a heavily grainy coating like some much older IPS panels feature and is also lighter than modern TN Film panel coating. It retains its anti-glare properties to avoid too many unwanted reflections of a full glossy coating, but does not produce too grainy or dirty an image that some thicker AG coatings can. 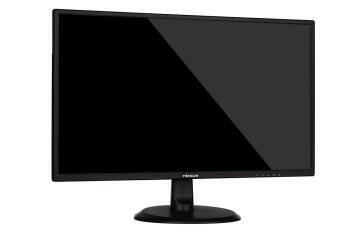 The screen uses a White-LED (W-LED) backlight unit which is standard in today's market. This helps reduce power consumption compared with older CCFL backlight units and brings about some environmental benefits as well. The W-LED unit offers a standard colour gamut which is approximately equal to the sRGB colour space, slightly wider according to our measurements in the following sections. Anyone wanting to work with wider colour spaces for their content, gaming or HDR would need to consider some of the wide gamut displays available instead or those with additional coatings added to extend the colour space. If you want to read more about colour spaces and gamut then please have a read of our detailed article. The Tests for this display are shown below. At all brightness settings a constant Direct Current (DC) voltage is applied to the backlight, and the screen is free from the obvious off/on switching of any PWM dimming method. As a result, the screen is flicker free as advertised. This section tests the full range of luminance (the brightness of the screen) possible from the backlight, while changing the monitors brightness setting in the OSD menu. This allows us to measure the maximum and minimum adjustment ranges, as well as identify the recommended setting to reach a target of 120 cd/m2 for comfortable day to day use in normal lighting conditions. Some users have specific requirements for a very bright display, while others like a much darker display for night time viewing or in low ambient light conditions. At each brightness level we also measure the contrast ratio produced by the screen when comparing a small white sample, vs. a black sample (not unrealistic full screen white vs. full screen black tests). The contrast ratio should remain stable across the adjustment range so we also check that. Graphics card settings were left at default with no ICC profile or calibration active. Tests were made using an X-rite i1 Display Pro colorimeter. It should be noted that we used the BasICColor calibration software here to record these measurements, and so luminance at default settings may vary a little from the LaCie Blue Eye Pro report you will see in other sections of the review. 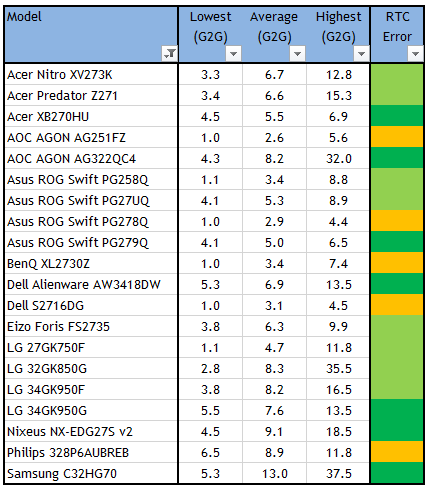 At the full brightness setting in the OSD the maximum luminance reached a high 327 cd/m2 which was a little higher even than the specified maximum brightness of 300 cd/m2 from the manufacturer. There was a good 251 cd/m2 adjustment range in total, so at the minimum setting you could reach down to a pretty low luminance of 76 cd/m2. This should be low enough for most people including those wanting to work in darkened room conditions with low ambient light. A setting of 13 in the OSD menu should return you a luminance of around 120 cd/m2 at default settings. It should be noted that the brightness regulation is controlled without the need for Pulse Width Modulation for all brightness settings so the screen is flicker free. We have plotted the luminance trend on the graph above. The screen behaves as it should in this regard, with a reduction in the luminance output of the screen controlled by the reduction in the OSD brightness setting. 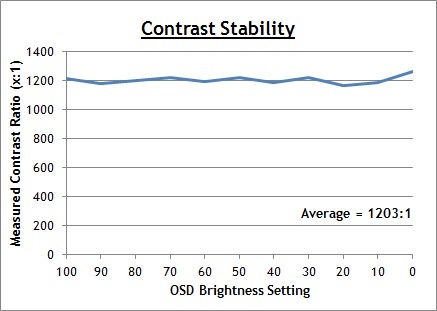 There is a slightly steeper adjustment curve from settings of 50 and below from the brightness control. The average contrast ratio of the screen was measured at an impressive (for an IPS-type panel) 1203:1 which was very good. This was a bit higher than the specified 1000:1, although it is impacted a little after calibration (covered later). We restored our graphics card to default settings and disabled any previously active ICC profiles and gamma corrections. The screen was tested at default factory settings using our new X-rite i1 Pro 2 Spectrophotometer combined with LaCie's Blue Eye Pro software suite. An X-rite i1 Display Pro colorimeter was also used to verify the black point and contrast ratio since the i1 Pro 2 spectrophotometer is less reliable at the darker end. Colour space coverage volumes - we also measure using a piece of software called ChromaPure the colour space (gamut) volumes produced by the backlight in comparison to the sRGB, DCI-P3 and Rec.2020 colour spaces. 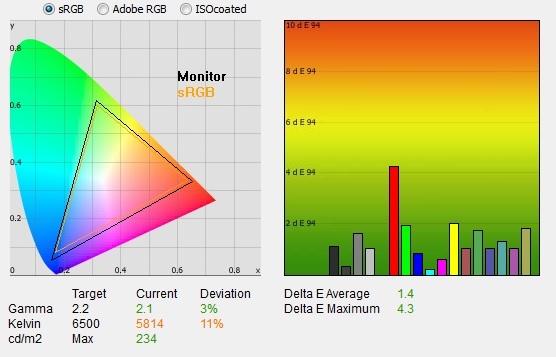 sRGB is the most commonly used colour space so it is important to have a decent coverage from the screen here. If the colour space is >100% sRGB then the screen can produce a wider colour gamut, often reaching further in to the wider gamut DCI-P3 (commonly used for HDR) and Rec.2020 reference spaces. dE average / maximum - we aim for as low as possible. If DeltaE >3, the color displayed is significantly different from the theoretical one, meaning that the difference will be perceptible to the viewer. If DeltaE <2, LaCie considers the calibration a success; there remains a slight difference, but it is barely undetectable. If DeltaE < 1, the color fidelity is excellent. Initially out of the box the screen was set with the 'Standard' Color Effect preset mode. The display was set with a fairly high 50% brightness which was too bright and uncomfortable to use for long periods. You will want to turn that down. The colours felt a bit too warm and you could tell the screen was using a normal sRGB standard gamut backlight. We went ahead and measured the default state with the i1 Pro 2. The CIE diagram on the left of the image confirms that the monitors colour gamut (black triangle) matches closely to the sRGB colour space reference (orange triangle). 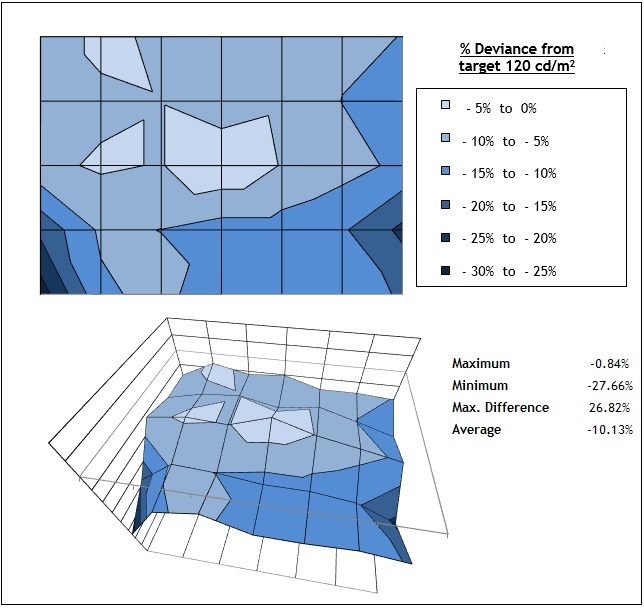 We measured using ChromaPure software a 107.8% sRGB gamut volume coverage which corresponds to 79.5% of the DCI-P3 reference and 57.0% of the Rec.2020 reference. This is slightly wider than some normal sRGB screens but nothing that would cause any issues. You wouldn't consider this an extended gamut really. Default gamma was recorded at 2.1 average with a small 3% overall deviance from the target which was not too bad as an average. The gamma curve was a bit off in the lighter tones (down to 2.12) but better in the darker tones. White point was measured at a too warm 5814k, being 11% out from our target despite being set to the 6500k mode in the OSD menu. Luminance at the default 50% brightness level was recorded at a bright 234 cd/m2 which is too high for prolonged general use, you will need to turn that down. The black depth was 0.19 cd/m2 at this default brightness setting, giving us a very good (for an IPS-type panel) static contrast ratio of 1221:1 which was very pleasing. Colour accuracy measurements here were very good with an average dE of only 1.4 recorded. Testing the screen with colour gradients showed smooth gradients with only minor gradation evident in places. There was no sign of any colour banding which was good news. Given the default 6500k colour temperature mode was a little off the target (too warm with 11% deviance at 5814k) we also measured the range of colour temp modes available in the OSD menu as shown above. The sRGB mode was actually closest to our 6500k target at 6012k, but still a little too warm. It might be best to switch to if you want to reach closer to that typical white point. The 'User' mode gives you direct control over the RGB channels which will be useful for calibration in a moment. You may also want to try our recommended OSD settings from the calibration section perhaps to see how those look. We used the X-rite i1 Pro 2 Spectrophotometer combined with the LaCie Blue Eye Pro software package to achieve these results and reports. 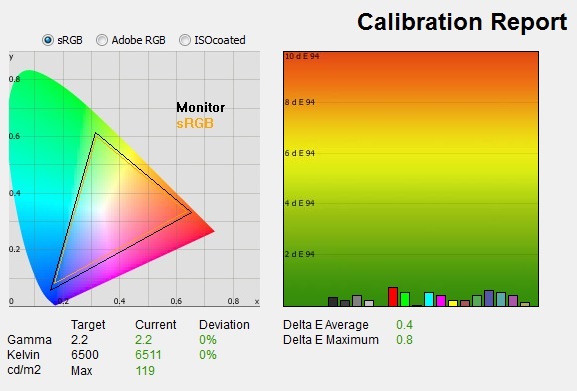 An X-rite i1 Display Pro colorimeter was used to validate the black depth and contrast ratios due to lower end limitations of the i1 Pro device. 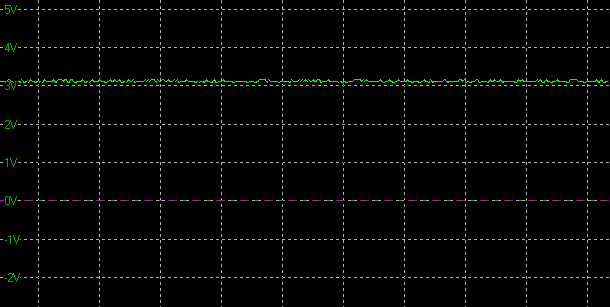 The OSD settings were adjusted as shown in the table above, as guided during the calibration process and measurements. These OSD changes allowed us to obtain an optimal hardware starting point and setup before software level changes would be made at the graphics card level. We left the LaCie software to calibrate to "max" brightness which would just retain the luminance of whatever brightness we'd set the screen to, and would not in any way try and alter the luminance at the graphics card level, which can reduce contrast ratio. These adjustments before profiling the screen would help preserve tonal values and limit banding issues. After this we let the software carry out the LUT adjustments and create an ICC profile. Average gamma had been mostly reliable on average out of the box, with only a small 3% deviance. After calibration in this mode we measured it at 2.2 average (0% deviance) and levelling out the gamma curve nicely across the different grey shades. The white point had now been corrected to 6511k which, thanks to the 'User' colour temperature mode and RGB adjustments, had fixed the too warm 11% deviance we'd seen before out of the box. Luminance had been improved thanks to the adjustment to the brightness control and was now being measured at a far more comfortable 119 cd/m2. We measured a black depth of 0.11 cd/m2 and this produced a static contrast ratio of 1085:1. This was a little lower than the default setup due to the adjustments to the RGB channels mainly in order to correct the white point. Colour accuracy of the resulting profile was excellent, with dE average of 0.4 and maximum of 0.8. LaCie would consider colour fidelity to be excellent. Testing the screen with various colour gradients showed smooth transitions with some minor gradation in darker tones but no visible banding at all. You can use our settings and try our calibrated ICC profile if you wish, which are available in our ICC profile database. Keep in mind that results will vary from one screen to another and from one computer / graphics card to another. The comparisons made in this section try to give you a better view of how each screen performs, particularly out of the box which is what is going to matter to most consumers. We have divided the table up by panel technology as well to make it easier to compare similar models. When comparing the default factory settings for each monitor it is important to take into account several measurement areas - gamma, white point and colour accuracy. There's no point having a low dE colour accuracy figure if the gamma curve is way off for instance. A good factory calibration requires all 3 to be well set up. We have deliberately not included luminance in this comparison since this is normally far too high by default on every screen. However, that is very easily controlled through the brightness setting (on most screens) and should not impact the other areas being measured anyway. It is easy enough to obtain a suitable luminance for your working conditions and individual preferences, but a reliable factory setup in gamma, white point and colour accuracy is important and some (gamma especially) are not as easy to change accurately without a calibration tool. Default setup of the screen out of the box was pretty good overall, offering a pretty accurate gamma curve, low dE and a strong static contrast ratio for an IPS-type panel. The colour temp was a little too warm which was really the only area with an issue, but thankfully that's quite easy to adjust via some simple OSD adjustments. When it comes to black depth and contrast ratio the screen performed well for an IPS panel at 1085:1 after calibration. This had dipped a bit compared with the out-of-the-box setup due to the need to adjust the RGB levels to correct the white point, and slightly tweak the gamma curve. 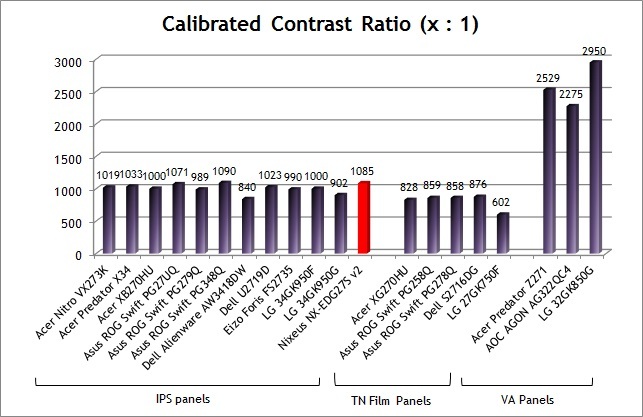 This was a decent result for an IPS-type panel though, and it surpassed the TN Film models compared here which typically reached around 850:1. 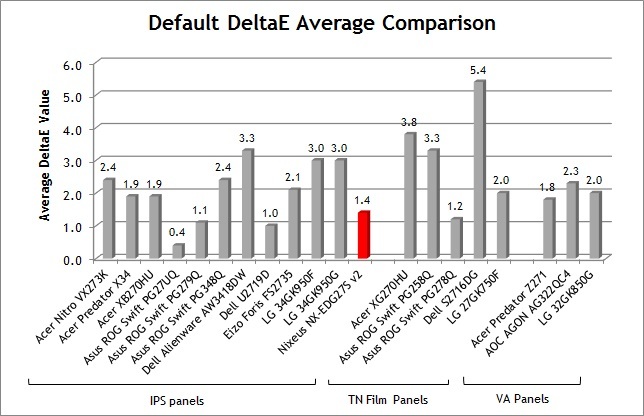 The VA panels can reach much higher though, up over 2000:1 easily as that's a strength of that panel technology. Viewing angles of the screen were very good as you would expect from an IPS-type panel. Horizontally there was very little colour tone shift until wide angles past about 45°. A slight darkening of the image occurred horizontally from wider angles as you can see above as the contrast shifted slighting. Contrast shifts were slightly more noticeable in the vertical field but overall they were very good. The screen offered the wide viewing angles of IPS technology and was free from the restrictive fields of view of TN Film panels, especially in the vertical plane. It was also free of the off-centre contrast shift you see from VA panels and a lot of the quite obvious gamma and colour tone shift you see from some of the modern VA panel type offerings. On a black image there is a characteristic pale glow introduced to the image when viewed from a wide angle, commonly referred to as IPS glow. This type of glow is common on most modern IPS-type panels and can be distracting to some users. If you view dark content from a normal head-on viewing position, you may see this glow as your eyes look towards the edges of the screen. The level of glow was typical for an IPS-type panel. Luminance uniformity of the screen was moderate, with the lower corners of the screen showing the most deviance from our centrally calibrated point. In the corners the luminance dropped down to 94 cd/m2 in the most extreme example. 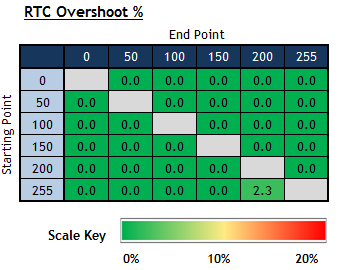 Around 57% of the screen was within a 10% deviance of the centrally calibrated point. We also tested the screen with an all black image and in a darkened room. A camera was used to capture the result. There was some clouding evident from all four corners of the screen. The bottom right hand corner showed a much more noticeable bleed from the backlight with a yellowish colour. This was actually a result of a slightly damaged screen, where the corner of the screen appears to have been knocked in transit from the USA to us in the UK. The edge of the plastic bezel was slightly cracked here, so this corner bleed is probably a result of that knock it seems to have had. Note: if you want to test your own screen for backlight bleed and uniformity problems at any point you need to ensure you have suitable testing conditions. Set the monitor to a sensible day to day brightness level, preferably as close to 120 cd/m2 as you can get it (our tests are once the screen is calibrated to this luminance). Don't just take a photo at the default brightness which is almost always far too high and not a realistic usage condition. You need to take the photo from about 1.5 - 2m back to avoid capturing viewing angle characteristics, especially on IPS-type panels where off-angle glow can come in to play easily. Photos should be taken in a darkened room at a shutter speed which captures what you see reliably and doesn't over-expose the image. A shutter speed of 1/8 second will probably be suitable for this. This screen features a 2560 x 1440 WQHD resolution, a significant step up from the wide range of 1920 x 1080 screens on the market and a comfortable resolution for this size screen we feel. These higher resolution 27" models offer a tighter pixel pitch of 0.233mm which results in a smaller text size than common 24" 1080p screens, although it is still a nice and comfortable size. We are very used to working with 27" 1440p screens all the time and find them very comfortable and a significant upgrade over 1080 / 1200p models. Some users may find the small text a little too small to read comfortably, and we'd advise caution if you are coming from a smaller screen for instance where the pixel pitch and text are normally larger. The extra screen size takes some getting used to over a few days as there really is a lot of room to work with but once you do, it's excellent. For those wanting a high resolution for CAD, design, photo work etc, this is a really good option. The image was very sharp and crisp and text was very clear. With its WQHD display, you enjoy 77% more desktop space than a full HD screen to spread out your windows and palettes. The light AG coating of the IPS technology panel is certainly welcome, and much better than the older grainy and 'dirty' appearance of older IPS AG coatings. Although it's been several years since those more grainy coatings were used. The wide viewing angles provided by this panel technology on both horizontal and vertical planes, helps minimize on-screen colour shift when viewed from different angles. The default setup of the screen was good overall which was pleasing, especially considering this is a gaming display and at a low retail price. The only real issue being the too warm colour temperature which was pretty easy to correct through some OSD adjustments. The brightness range of the screen was very good, with the ability to offer a luminance between 327 and 76 cd/m2. This should mean the screen is useable in a wide variety of ambient light conditions, including darkened rooms. 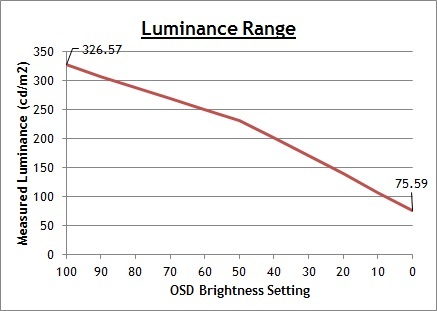 A setting of ~13 in the OSD brightness control should return you a luminance close to 120 cd/m2 out of the box. On another positive note, the brightness regulation is controlled without the need for Pulse Width Modulation (PWM), and so those who suffer from eye fatigue or headaches associated with flickering backlights need not worry. There was no audible noise from the screen, even when conducting specific tests which can sometimes cause issues. There are no specific preset modes for office or text work, but there are 3 blue light reduction modes (called "Low Blue Ray" in the menu - nothing to do with the video disc format though!) There are options for low, middle and high which basically make the image warmer each time and reduce some of the cooler blue spectral output. There are no USB ports on this particular screen which is actually very rare now in the monitor market. It's probably not much of an issue given this is firmly a gaming screen, but they are missed a bit for office situations. There are no other extras like ambient light sensors or card readers on this screen either. The version of the NX-EDG27 v2 that we are testing is the S model, which has only the basic tilt adjustment stand. This means that the adjustment of the monitor is not very versatile, so if you want more flexibility then the non-S model would of course be better. 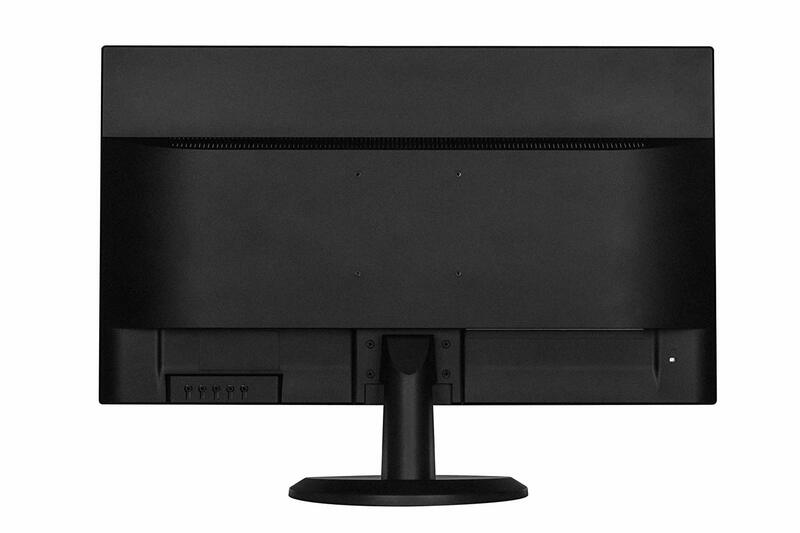 There is also VESA 100mm mounting capabilities for those who want to arm or wall mount the screen instead. 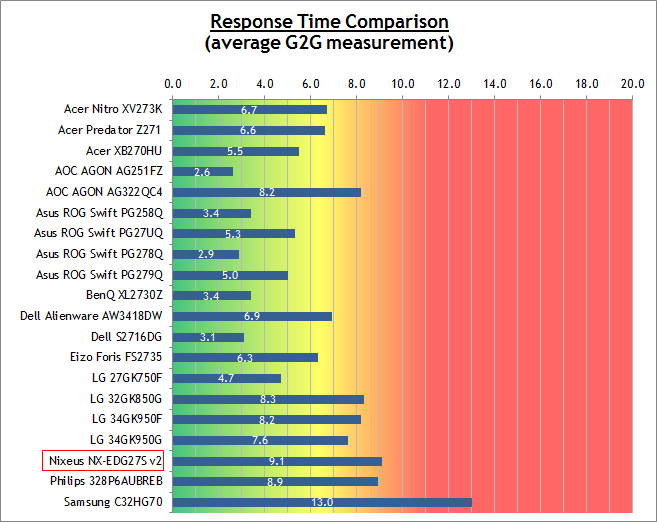 The NX-EDG27S v2 is rated by Nixeus as having a 4ms G2G typical response time. The screen uses overdrive technology to boost pixel transitions across grey to grey changes as with nearly all modern displays. The part being used is an AU Optronics M270DAN02.3 AHVA (IPS-type) technology panel. Have a read about response time in our specs section if you need additional information about this measurement. We carried out some initial response time measurements and visual tests in each of the overdrive settings, and at a range of refresh rates. The response time control is available in the OSD menu via the 'Over Drive' option as shown above. These tests were conducted at a fixed refresh, with performance being the same whether FreeSync was turned on or off in the graphics card menu. We will talk about the use of FreeSync VRR (Variable Refresh Rate) in applications in a moment as well. With the Over Drive set to 'off' we saw pretty consistent response time performance at all refresh rates here. This is to be expected really as without overdrive being applied to the pixels, the underlying response time should remain the same independent of the refresh rate. An average here of around 12ms G2G was recorded, with no overshoot at all - which again is expected given no overdrive is being applied. Some transitions from black to grey (along the top row of the table when changing from 0 to 50 and 150) were particularly slow at up to 22ms. This did result in some black smearing on moving content where darker colour transitions were taking place. As you reach up to the higher refresh rates the response times when set to 'off' are not really fast enough to keep up with the frame rate, so you get some additional blurring to the moving image. It doesn't look as sharp as it should. With the Over Drive control now pushed up to the maximum 'High' setting you could see some improvements at these fixed refresh rates in the response times in our measurements, and in visual tests. At 60Hz we measured the fastest response times, now averaging 7.9ms G2G. However there was some moderate overshoot measured, and in practice you could see some slight pale haloes behind moving objects, especially on lighter coloured backgrounds. If you are using the screen with a fixed 60Hz input like a console or Blu-ray player, we would recommend experimenting with the Over Drive control to find the level which looks best. We felt the 'Middle' setting looked the best, cutting down on most of the visible overshoot while still offering improved motion clarity and less blurring than if you just turned overdrive off altogether. As the refresh rate was increased the overdrive impulse, and therefore the response times actually reduced a little, not uncommon for FreeSync screens we've found. 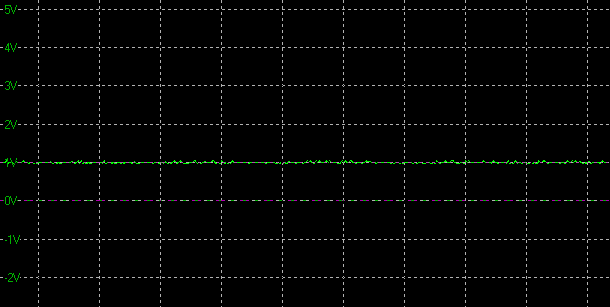 This meant that at 100Hz the average G2G response time was now 8.8ms, and slightly slower at 9.1ms at 144Hz. We've commented on this before with other FreeSync screens as you would have thought that the overdrive impulse would be turned up as you increased the refresh rate, to boost the response times a bit. Actually it doesn't make much difference here as at 60Hz where it was turned up a bit higher, it produced a bit too much overshoot and so the levels it was set at for the higher 100Hz and 144Hz refresh rates seemed to be more optimal anyway. It's no big deal here, and the only thing you need to keep in mind is turning the Over Drive control down from 'high' to 'middle' (or lower) if you're using a fixed 60Hz refresh rate. At the higher refresh rates, even with the Over Drive turned up to the maximum 'high' setting there were some pixel transitions which were not quite fast enough to keep up with the frame rate. You need them to be consistently under 6.94ms to keep up with the 144 fps speed here (1000ms / 144 fps = 6.94ms), and so a few were a bit too slow. In practice this leads to a bit of added blurring, and it was most noticeable on darker content where you would see some black smearing. It was not as bad as you'd see from most VA panels where these transitions are particularly problematic, but those pixel response times were a bit slow here. The screen natively supports AMD FreeSync for variable refresh rates between 30 and 144Hz which is a nice wide range. 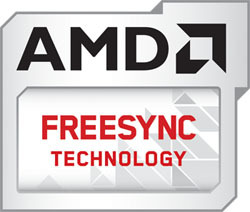 AMD FreeSync Technology is supported with DisplayPort and HDMI connections - allowing the NX-EDG27v2 to be compatible with AMD Radeon Graphics Cards (and modern NVIDIA cards for G-sync), Xbox X, Xbox One, and other future gaming consoles and devices that support FreeSync and Adaptive-Sync. While not being officially certified under NVIDIA's new 'G-sync Compatible' scheme, the NX27S v2 will support G-sync as well from compatible NVIDIA graphics cards and systems, over DisplayPort only. With AMD FreeSync enabled additional features include Low Framerate Compensation (LFC) and variable Anti-Ghosting (Over Drive) that are automatically active with the NX-EDG27 v2 to ensure optimal visual gaming performance regardless of gaming frame rates. Basically what is being advertised here is a dynamic overdrive control depending on the active refresh rate when using VRR. To make use of this variable overdrive when using FreeSync you actually have to turn the Over Drive setting 'off' in the OSD menu when you are using FreeSync/G-sync. We spoke with Nixeus about how this is supposed to work, and basically the screen will then dynamically control the overdrive impulse between the equivalent of the 'low', 'middle' and 'high' levels, depending on the active refresh rate. 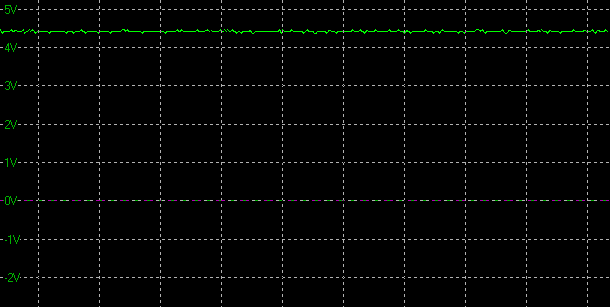 So at the lower refresh rates it tones down the overdrive a bit to avoid any unwanted overshoot, then as it reaches higher refresh rates it pushes the overdrive up towards what would have been the 'high' setting. This helps ensure the fastest response times at the highest refresh rates while also minimising any overshoot problems. It is not possible for us to measure response times using our oscilloscope in a VRR environment and so we had to rely on visual tests. 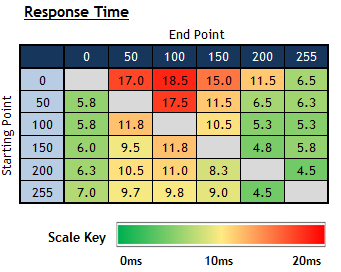 With VRR enabled the response time performance seems to be pretty consistent, and in line with some of the static refresh rate performance we had seen before. You could of course just stick with the maximum 'high' Over Drive setting all the time, although if the frame rates reach down to the lower end around 30 - 80Hz you may see some added pale halos from the overshoot. Using the 'off' mode for VRR makes sense and seems to help avoid this. We are working on other methods for creating repeatable test patterns while in a VRR environment so will add to this section later on if we are able to provide any further thoughts or measurements. We carried out some further response time measurements at the maximum 144Hz refresh rare supported by the screen. For this we left the Over Drive setting at 'high' which applies the maximum overdrive to the pixels at this static refresh rate. If you are using the screen with FreeSync/G-sync and with Over Drive turned 'off', then the same response times will apply once you reach the highest refresh rates as well. Having taken some further measurements at a range of pixel colour transitions, the average G2G response time was more accurately measured now at 9.1ms. Some transitions reached much lower, down to 4.5ms in the best cases and almost in line with the advertised 4ms G2G figure. There were a range of pixel transitions which were however quite a bit slower, mostly in the middle area of the table on changes between similar shades where they were around 10 - 12ms typically. Along the top row of the table where the pixels were changing from black (0) to dark grey shades (0 > 50 and 0 > 100 for instance), the response times were at their slowest, reaching up to a maximum of 18.5ms measured. This did result in a bit of black smearing on darker content, but certainly not as bad as you see from VA panels which have characteristic slow black > grey pixel response time (often reaching up to 40ms or so). 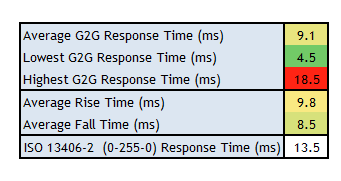 If we discount the particularly slow transitions in this table the average response time is around 7.9ms G2G. This isn't quite fast enough to keep up with the 144Hz frame rate, although it didn't seem to add too much in the way of additional motion blur. You may find capping your frame rate up to around 120fps might be more optimal in case of some slight added blur at the top end. Even with the Over Drive at the maximum setting there was no overshoot really at all, only one transition measured any at all (2.3%) which is nothing you'd ever notice in practice. That was very pleasing. We have provided a comparison of the NX-EDG27S v2 against many other gaming screens we have reviewed in a similar size range and technology. The Nixeus was a bit slower with a 9.1ms G2G response time overall than some of the other high 144Hz refresh rate 27" 1440p resolution IPS models we've tested such as the still popular Acer Predator XB270HU (5.5ms) and Asus ROG Swift PG279Q (5.0ms). In practice there was a little more blur detectable and moving images didn't look quite as sharp. Those other models are NVIDIA G-sync screens and seem to offer a more consistent response time performance, perhaps thanks to the added G-sync module and the way it controls overdrive. 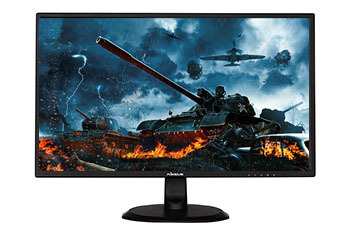 FreeSync screens (which don't feature the NVIDIA G-sync hardware module) are often a little slower, for example the Eizo Foris FS2735 (6.3ms) or the 34" ultrawide LG 34GK950F (8.2ms) tested recently. It does seem that G-sync screens tend to have more consistent and sometimes faster response times than competing FreeSync screens in general. 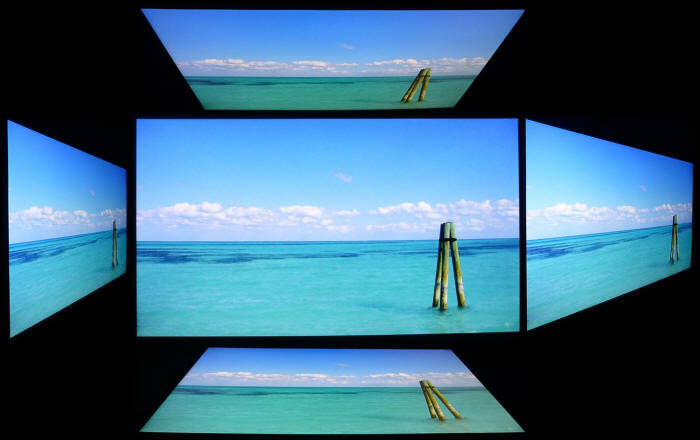 Aspect Ratio Control - the screen has 5 settings for hardware level aspect ratio control. This includes options for full, 16:9, 5:4, 4:3 and 1:1 pixel mapping. This should offer good support for any non-native aspect ratio sources if you need. Preset Modes - There is a 'game' Color Effect mode in the menu but oddly that seems to make the image far less colourful, almost looking a bit black and white in appearance. We would just stick with your standard mode. As there are no presets as such to set up different settings for gaming you might need to alter your OSD settings if you want something brighter or more colourful for gaming each time. The total lag measured was only 5.0ms. With around 4.55ms of that accounted for by pixel response times, we can estimate there is only 0.45ms of signal processing lag, the actual lag you might feel during gaming and other uses. This was basically nothing and in line with even the fastest gaming screens in the comparison above, including those without a scaler and instead featuring an NVIDIA G-sync hardware module. A great result when it comes to lag from this Nixeus screen. Useful additional 2x HDMI input for external Blu-ray players or games consoles. There is a Movie Color Effect preset mode which looks quite similar to our calibrated standard mode. These preset modes don't seem to change any other settings so not sure how useful they are. Some clouding in the corners, and a bit of bleed from where one corner had taken a knock in transit. No local dimming or any of the necessary elements to provide an HDR experience. There is a slight boost in colours compared with a traditional sRGB screen, but only creating 108% sRGB, equating to ~80% DCI-P3. If you would like to help support our continued work please consider making a donation no matter how small or large. Thank you for the continued support. The Nixeus NX-EDG27S v2 provides an interesting option in the 27" 144Hz IPS gaming space because of its competitive price point. This is currently $400 USD at the time of writing, making it over $200 cheaper than popular competing models like the Acer Predator XB271HU ($600) and Asus ROG Swift PG279Q ($700). It's received a fair bit of interest online as a result and given its spec. With NVIDIA now offering G-sync variable refresh rate support from FreeSync models like this, you're also no longer limited to purchasing a normal G-sync screen, another reason why the Nixeus model is a bit cheaper. 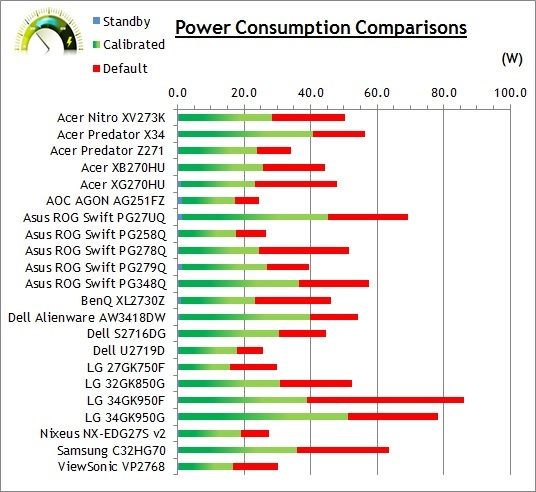 But price aside, can it compete with those other models when it comes to performance? Gaming is obviously the primary concern with this screen and overall we felt the screen did well. The response times were a little slower than we had hoped, and there were a few pixel transitions that lead to a bit of black smearing on moving content, even at the optimal overdrive settings. It resulted in a bit of added blur at the upper end of the refresh range as the response times weren't quite fast enough to keep up. The screen still provided good motion clarity overall, especially considering it's an IPS panel. The high refresh rate support up to 144Hz of course helps massively when it comes to gaming and motion clarity too compared with common 60Hz panels. Support for FreeSync and G-sync was very welcome, with a wide VRR range available. The lag of the screen was basically zero which was great news of course. The screen does lack some of the gaming "extras" that you might see on other models - RGB lighting systems, black stabilizer modes, FPS counters etc but if you aren't bothered by some of the frills then it won't matter to you anyway. Away from gaming the default setup was pretty good and easy to tweak to provide a reliable and accurate image. The IPS-type panel offers strong all round image quality with wide viewing angles, strong contrast ratio, stable colours and a good resolution for the screen size. The stand on the S model was limited to only tilt, so we would recommend the fully adjustable stand version if that's going to be an issue for you (although it might add to the cost a bit). All in all if you're looking for a more basic design, and don't mind sacrificing some of the added extras and features of the more well-known models, the NX-EDG27S v2 provides a good option for a 27" high refresh rate IPS panel at an attractive price point.